Good vocals are usually what separate a good track from a great one you keep playing over and over again, waiting for your favorite part to come on. An advanced harmony or a well-placed choir can add a special dimension to a song and often send shivers down our spine. 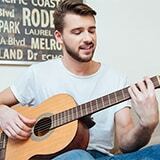 But, getting a perfect harmony can be a difficult task, especially if you’re an amateur musician. That’s where vocal harmonizer pedals come in – they add color to your vocals and provide you with great harmonies, usually along with some useful vocal effects like auto-tune or delay. They can be especially useful if you’re alone on the stage with nothing but a guitar and a microphone. You can use them to add some girth to your choruses. There are many vocal harmonizer pedals out there – from more simple ones that just follow a certain key as you strum chords, to advanced ones that have complex effects. 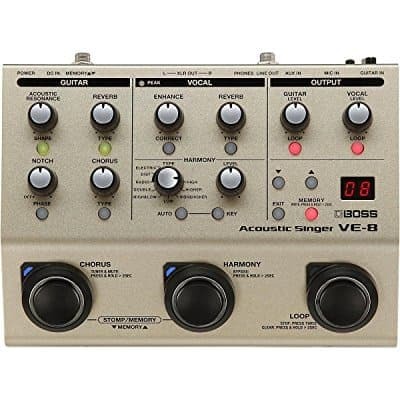 I’ve chosen the best of both worlds and created this list of the very best vocal harmonizer pedals to help you with your choice. Here are my top six picks for vocal harmonizer pedals that will do wonders for your vocals. If you’re a guitar player, you’ve probably heard of the company TC Electronics, as they are quite famous for their high-end guitar effects. TC Helicon, their subsidiary, seems to follow this tradition with some excellent vocal processors and harmonizers (spoiler alert: this isn’t their only product on my list). The Harmony Singer 2 is a perfect pedal if you’re just getting into the world of vocal processing. No bigger than a regular guitar stomp box, it’s sturdy and easy to carry. It’s very easy to use, as it features only three control knobs on the front: Harmony, Level, and Reverb. Harmony sets the specific pitch interval, Level adjusts its volume, while Reverb gives some extra color to your vocals. The pedal analyzes your chords and follows your guitar, staying in perfect pitch. It’s easy to connect and set up, although it’s best if you keep it at the front of the chain if you have multiple pedals. 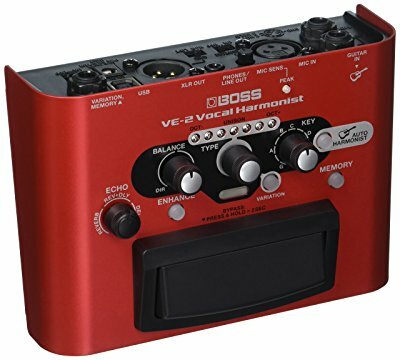 A more advanced option than the Harmony Singer, the Boss VE-2 offers more features and provides you with a great, studio-like sound in a live show environment. Like the Harmony Singer, it “listens” to your chord progression and follows it with some sweet harmonies, although you have an option to set your song key manually. This way, you can make sure the pedal follows your guitar perfectly. The thing that strikes me about this pedal is the very natural sound of harmony voices – it’s very subtle, but provides you with colorful support. You can also choose between 24 different types of harmonies to create the perfect vocal environment for a specific song. One thing that’s perhaps out of character for Boss products is that the user interface is somewhat confusing and takes some time to get used to. A new generation vocal processor, the Digitech VLFX provides you with some more advanced features, as it has more than 65 vocal effects to choose from. It offers interesting effects like delay, reverb, and even distortion, which really gives you some options to experiment with your vocal performance. It also has a looper effect that allows you to record a vocal sequence, play it back, and sing over it. This can be a great feature for live shows, especially if you perform alone, as it creates an illusion of multiple singers and makes your songs more dynamic. 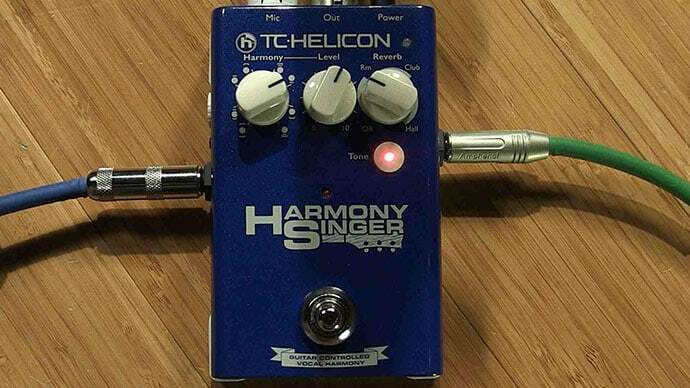 Another great vocal harmonizer pedal from TC Helicon, the Harmony-G XT is on the complex side of the vocal processor spectrum. In fact, calling it just a vocal harmonizer would be an understatement, as it offers an abundance of features and effects. It includes effects like reverb, echo, and pitch correction, and it even allows A/B switching between the effects. Given all these things, it’s surprisingly easy to use, while giving you a lot of opportunities to experiment and explore your voice. It has great range and its auto-tune is spot on. It can also be used without an instrument just by setting the key. A particularly neat feature is the built-in guitar tuner which can really come in handy during live shows. Going further down the complexity spectrum, we’ve reached the Boss VE-8. This pedal gives you a lot of control over your voice with some sweet effects and even provides you with some guitar settings, such as acoustic resonance and reverb. This can be really helpful, as it gives extra color not only to your voice, but to your guitar tone as well. It includes a great 80-second looper, along with a stereo input for your music player, which enables you to play along with your studio material. It’s easy to set up and use, so you’ll start playing around with different harmonies and effects in no time. It may seem like I have a thing for TC Helicon, but trust me – when searching for the best vocal harmonizer pedals, you’ll be stumbling across many of their products. This Canadian company really devoted itself to making professional, high quality vocal processors. This is most certainly the case with their VoiceLive 3, which offers some of the best vocal effects on the market. It enables you to create a full band effect with advanced controls for your guitar, as well as for vocals. It also includes multi-track looping that rounds to the nearest beat if your timing is slightly off. With plenty of built-in options and great-sounding effects, this is the most advanced pedal on the list, but it comes at a significant increase in price, as well as complexity. With many effects and different features, vocal processing pedals can be hard to compare. Before making a final choice, here are some things you should look for in your vocal harmonizer pedal. Key tracking – Although many manufacturers will say that their pedal can follow your key perfectly, some of them can go slightly “off road”. This is especially common if you play more complicated chord progressions. This isn’t a problem with most high-end pedals, but make sure your pedal has the option to manually set the key of the song. Gender shifting – If you really want a pedal that will complement your vocal range, you should examine how effective your pedal is in gender shifting. That is when the pedal creates an illusion that a male or a female voice is accompanying yours. Harmonizing – Even though harmonizing is at the core of this article, it’s worth mentioning that you should always go for pedals that specialize in harmonies, rather than vocal processors with harmony effects. You want to hear a natural, organic tone in all layers. Pitch correction is also a great feature, so look for pedals with this effect, as you will find it useful in the future. 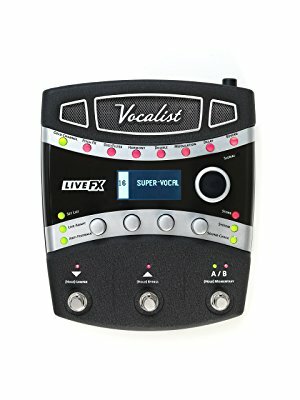 If you’re looking for a vocal harmonizer pedal to enhance your performance, I hope my list helps you in your quest. Vocal harmonizer pedals are a great way to add some color to your tunes and make them more dynamic. Just remember not to overuse them, as too many harmonies and different voices can sound cartoonish at times. To achieve the best effect, use them only to emphasize certain parts of the songs.